Guy’s Burger Joint: a free-of-charge poolside venue developed in partnership with Food Network personality Guy Fieri serving hand-crafted burgers and fresh-cut fries enjoyed amidst a décor that celebrates the chef’s California roots and love of car culture. New Staterooms and Enhancements: Thirty-eight staterooms have been added – two Grand Vista suites offering floor-to-ceiling windows, 22 junior suites, two scenic ocean view and 12 interior accommodations. Additionally, private verandahs have been added to 98 existing staterooms, creating spacious new 230-square-foot staterooms with balconies. All staterooms offer new island-inspired interiors with bright colors and soothing pastels inspired by Carnival Elation’s tropical itineraries. WaterWorks: Located on Verandah Deck, this expansive all-ages water park features an enclosed 300-foot-long Twister water slide full of exhilarating twists and turns, two 82-foot-long racing slides, and a splash zone for kids. Mini-Golf Course: A nine-hole miniature golf course has been relocated to Deck 14, providing a fun and relaxing pastime for families to enjoy in the fresh sea air. Carnival is Jacksonville’s only year-round cruise ship offering four- and five-day cruises to The Bahamas featuring stops at Freeport, Nassau and the private destinations of Half Moon Cay and Princess Cays. Carnival Cruise Line also received “Editor’s Picks” in the categories of Cruise Line with the Highest Client Satisfaction (more than 1,300 passengers), Cruise Line Providing the Best Travel Agent Support (ocean-going) and Best Cruise Line for Family Activities. For the annual WAVE Awards, the editorial team at TravelAge West reviews hundreds of travel suppliers and products. Travel agent professionals throughout the 15 Western states and readers of TravelAge West were invited to vote from a list of Editor’s Pick award recipients. Review methods included product analysis, on-site visits, a survey of a select group of travel agents and online research. Winners were announced at a gala event that recognizes the outstanding qualities and services of the industry’s leading travel suppliers. 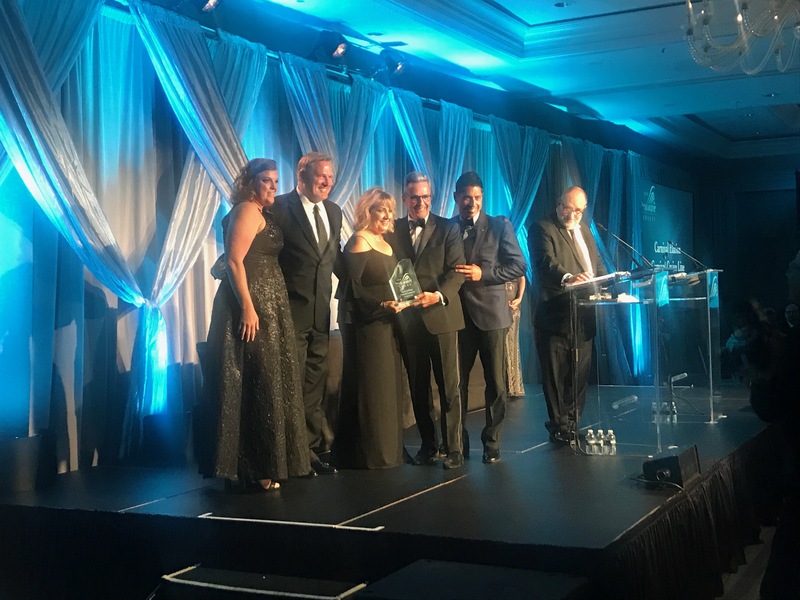 Pictured from left to right – Irene Gawdzik (Manager, Business Development), Mike Julius (VP, Field Sales North America), Vicki Tomasino (Regional VP – Western Region), Bruce Shulman (Northstar Media), Drew Santiago (Business Development Director), Ken Shapiro (Host and Editor, TravelAge).